This 4th tour to Japan by the Teatro Comunale di Bologna raised the curtain with Donizetti's La Fille du Regiment, which amongst his over 70 operatic works has been rarely performed. One of the reasons for its rare performance is that there are few tenor singers who can play the part of Tonio, the leading role in this work. He must sing an aria involving nine High C's which also calls for light, soft singing. 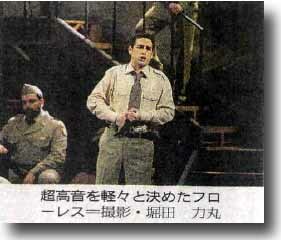 Juan Diego Flórez, playing the role of Tonio this time, beautifully fulfilled this requirement. After singing that aria very easily, he also sang an encore. Most of those in the audience felt that his voice - where secure pitch, lightness and brightness mingled beautifully is that of a miraculous "bel canto tenor". The time setting was transferred to the Second World War and the French regiment in the original was changed to an American regiment. Sagi said, "I re-did the work as if it were a Hollywood musical" The set was very like one in a motion picture. The opera was originally written in the style of French Opera Comique with intermittent spoken dialogue, but the new setting made the work more interesting as a drama. Conscientious performances from the non-speaking supporting roles contributed much to the overall success of the staging. Stefania Bonfadelli who played the title role pleased the audience with her lovely appearance and comic performance. Bruno Praticò playing the part of a buffo baritone, and Elena Obrazova, a famous, veteran mezzo-soprano, also appealed to the audience. As a whole, the performance was excellent, making the audience simply enjoy the opera. The conductor was Bruno Campanella. Performed on June 3rd at Orchard Hall.